Many years ago, while taking my nieces on a little nature walk, I remember watching as my youngest niece picked up a pinecone and tried to eat it. I can only imagine how prickly the scales were on her tiny tongue! 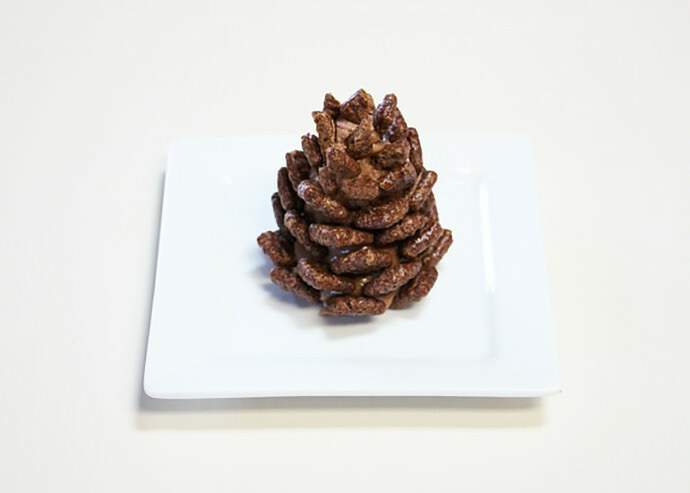 Here’s an idea for a pinecone snack that’s sure to make curious tastebuds happy. Made with dry cereal and a peanut butter mixture, it’s part-healthy, part-sweet, and 100% fun. It’s a great edible craft for the kids to make this winter when the snow arrives and cabin fever sets in. No baking required—just mix and assemble. 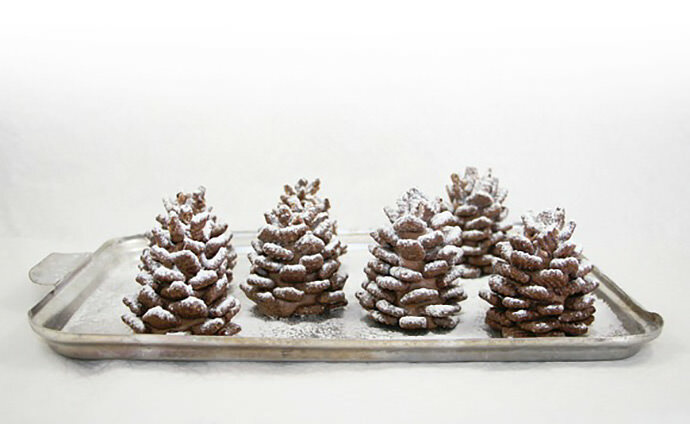 And while they’re a clever snack for kids, these chocolate pinecones also look very chic and elegant at a winter wedding reception or other snow-themed event. Mother Nature never tasted so sweet. Mix the peanut butter, Nutella, butter, and powdered sugar in a bowl. 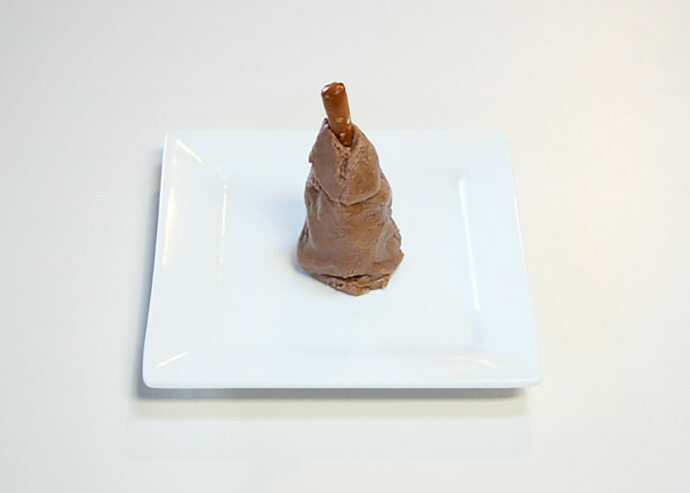 Take a pretzel stick and mold some of the peanut butter mixture around it, forming a slight cone shape. 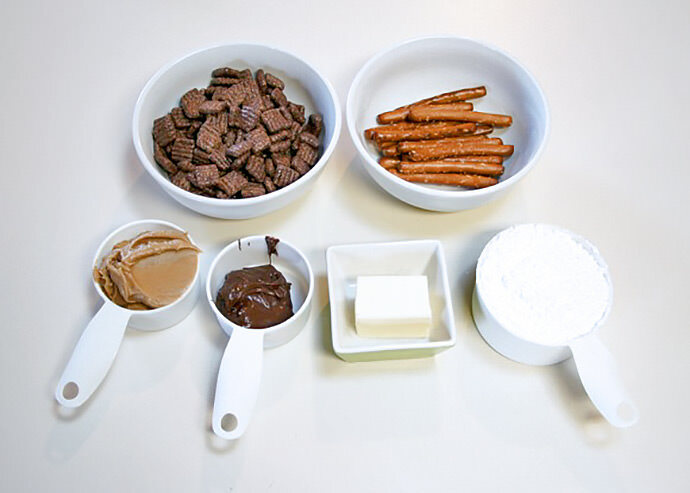 Holding it steady by using the tip of the pretzel as a handle, start inserting pieces of cereal into the peanut butter mixture in a symmetrical pattern around the stick. Add more cereal pieces, staggering them as you move upward, until you get near the top. 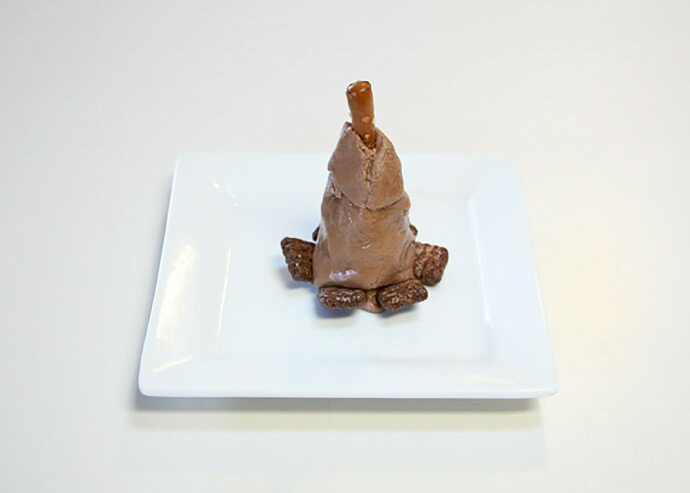 If your pinecone is getting too tall (like mine were), cut off the top of the pretzel and add a dollop of peanut butter mixture to cover it. 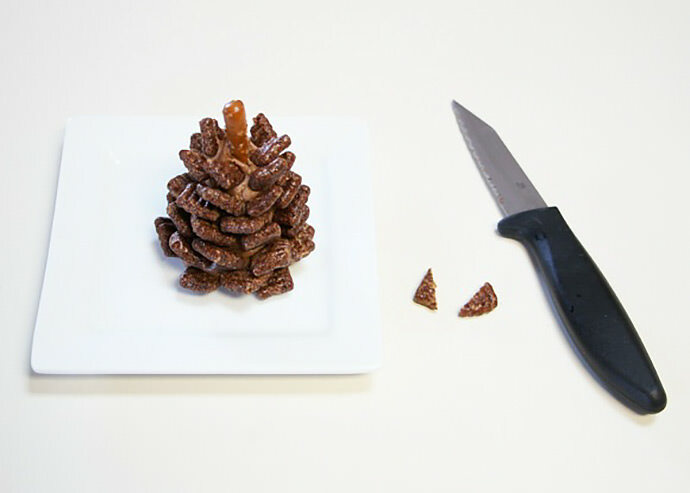 Insert a few more triangle pieces of cereal into the top of the pinecone. For a “snowy” effect, dust the pinecone with powdered sugar. So now for the big question…. How do you eat a pinecone? Simple! Pluck it apart, piece-by-delicious-piece. 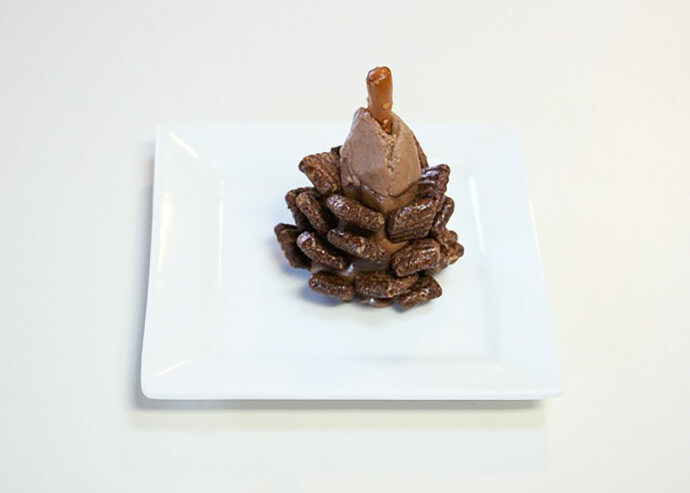 That’s pretty awesome… I remember being a kid myself and wishing I could eat a pinecone! I completely agree! We love this ahhhmazing project! Thats hilarious! Sandra is a genius! 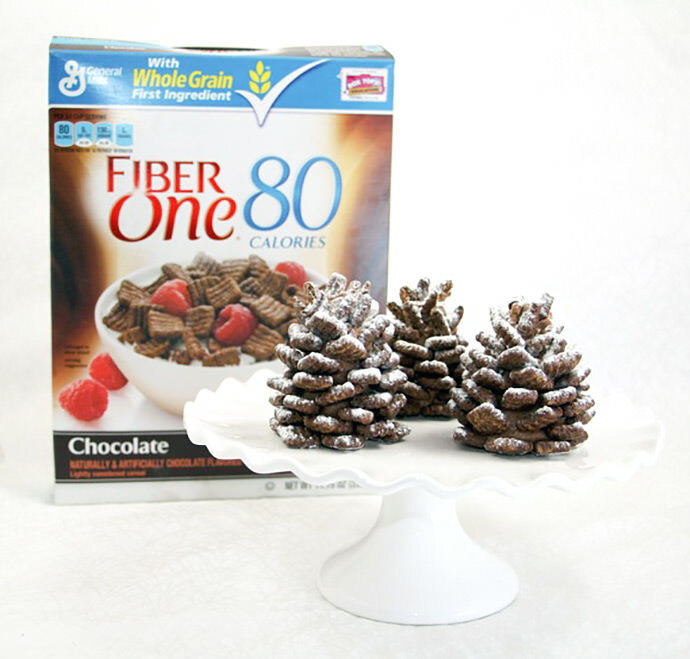 So pretty :) Can you replace the fiber-cereal with a sweeter version? Eventually chocolate chips maybe? Absolutely! Try whatever works for your tastebuds. My goal for this recipe was to make it as easy as possible. I was originally planning to use chocolate Frosted Flakes cereal, but I couldn’t find any. And I was pleasantly surprised at how yummy the Fiber One cereal is. (I’m a big fan now.) You could try Golden Grahams or Cinnamon Toast Crunch. Maybe teensy-tiny versions with Cocoa Pebbles? Good luck! Yes, Rachel…she is genius. I have a habit of taking a theme to the extreme, It’s a true passion of mine. I absolutely love this post. As a Home Educator and sometimes Pre-School Teacher, this is going straight to my “keep forever Files” I’m always looking for ways to expand a literature theme with my students and this is BRILLIANT. Oh, but the fun of a Blizzard! My three will absolutely make a blizzard too. We have already planned the day to make these. Thanks so much, Laura. 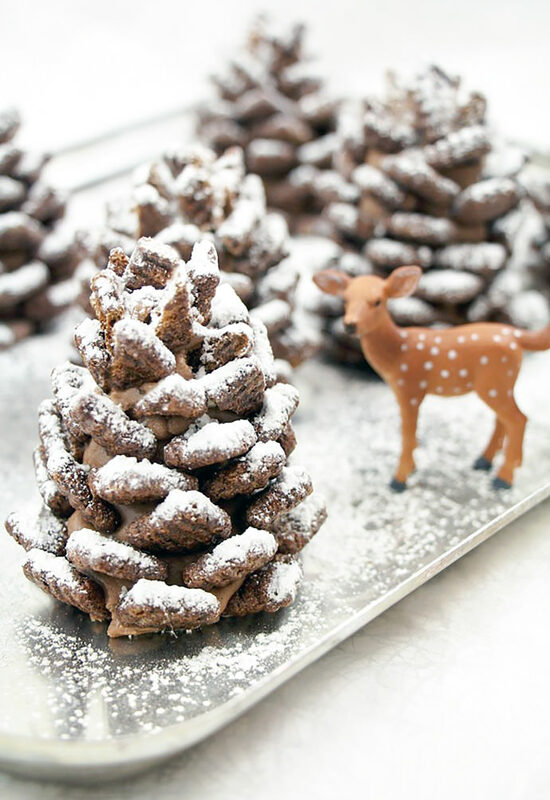 I really appreciate the blog love for my pinecones. You’re right…. they do look like mini, snow-covered fir trees for gingerbread houses. Cute idea! Be sure to put a tiny, red, candy cardinal on one of them, please? soooooo genius! but then again everything Sandra does, is. This recipe is amazing! I love it! Thanks Lisa! That means a lot coming from a fellow kitchen creative. These are precious! I’m so impressed! Yes. Spreadable chocolate, frosting, cream cheese. All of these would work just fine. 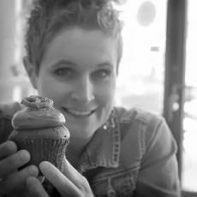 Simply Amazing recipe…beautiful tutorial. Thanks so much…I’m gonna have to try this. Love it! Good question. Most cookie doughs freeze just fine for 4-6 weeks. So I would think this dough would be OK too. (But I have not tried it myself. I’d hate to be wrong.) I know some people freeze cereal to extend the shelf life, so I’m sure that would be OK too. I’m doing these for my littlest’s 5th Birthday party. We are theme people and her chosen theme is “Frozen”. I think this will make an excellent center piece. Can’t you just see Olaf in there? Creating these at our Cookie Day 2014 with the kids! Nothing says “fun” like making a craft you can then eat!!!! “Do you wanna build a pinecone…..” Love the idea, T. potts!!!! I adore these! SO very clever! This makes me super hungry. I’m surprised how realistic they look too! yummmmm!!!! I’ll be making these soon! These look ridiculously realistic. Do you have any tips for the powdered sugar? Or should I just sieve it over the pine cones like I would over anything else? The last thing I want to do is mess up the very last step! Yep, a sieve or flour sifter will both work great. it’s so impressive! congratulations on your creativity! I’ll definitely make them for christmas ! How many pinecones does this recipe make? Do they sell Chocolate Chex in Canada? Or maybe Golden Grahams? Any brown, squared cereal would work well. A few people have asked if these can be prepared a few days ahead of time….. I think that would be just fine. You’ll want to put them in a sealed container and maybe keep them frozen or at least refrigerated. I’m not sure how well the cereal will hold up once it’s been inserted into the peanut butter/Nutella mixture, but keeping them cold will certainly help. 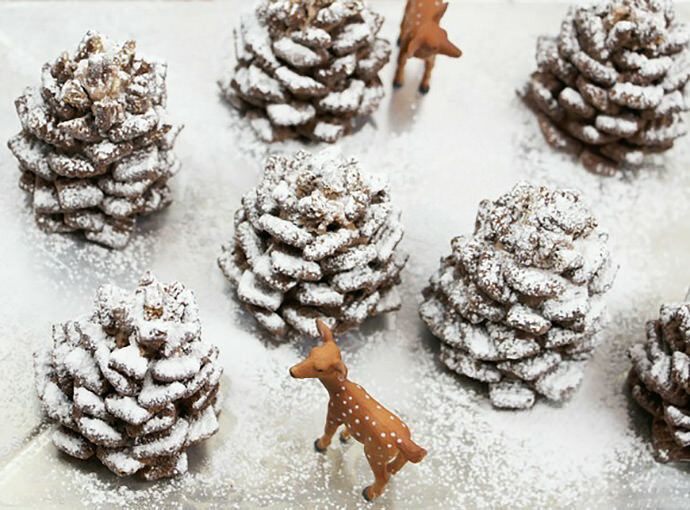 And, if you can wait to sprinkle the powdered sugar until you’re ready to display or serve the pinecones, it will help them look & taste fresh – just like newly fallen snow. 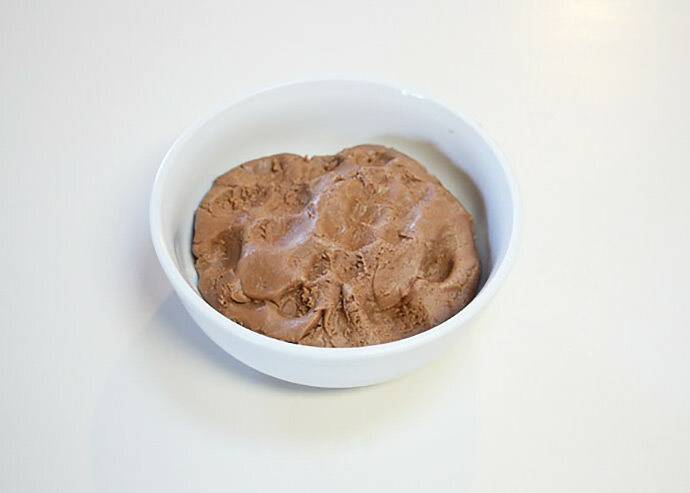 Try Life Cereal dusted in cocoa powder. oh my gawd, I LOVE this!! Loved that! Thanks for sharing. I saw a couple of pinecones in the background that looked pretty spot-on. Maybe the creator of the “Nailed it” version was hittin’ the eggnog a little hard? Love this idea!!! Are there other similar cereals that work as a substitution? I am in Canada too! I found cereal called “Crave” which looks just like what’s shown about but it has a chocolate centre. Definitely unhealthy kids food, and expensive, but worth it for a super cute nature-themed Yule log! Chocolate Toast Crunch! Pinecone Perfection! This will make approximately 6 pinecones. These look amazing. I am not great in the kitchen but these will look like I have slaved and took a class, Thank you for sharing! These are definitely going to make it onto my Christmas table. Any ideas for a peanut butter substitution? We have a nut free school. sunflower seed butter. or cream cheese beat with a bit of powdered sugar would work. you can also use eggless cookie dough you can eat to make the base. This is brilliant! 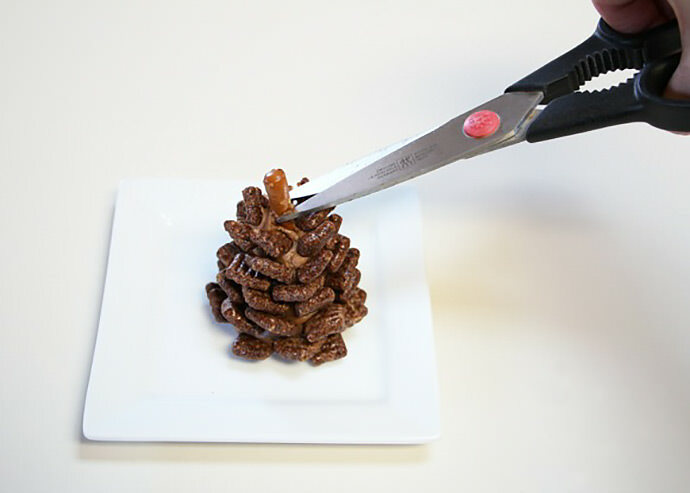 I had no choice but to click on the thumbnail to see how the heck you made an edible pinecone! Amazing. Except we are going all out. Chocolate Chex it is! These are so amazing that I actually thought they were real! Wow, at first glance I really thought this was a real pinecone! Great job, it looks delicious and I’d definitely want to try this out sometime! Does the recipe make 5 like shown in the picture? I’m making them for a cooking class with 15 students and need to know how much supplies to purchase. At first, I clicked on this thinking it was a crafty way I could do something with the approximately 32.7 million pinecones on our property; these looked SO real at a glance, lol! But…Nutella? Chocolate Chex? Peanut butter? Powdered sugar? Oh, please, PLEASE sign me up! Although these pine cone treats were delicious they were extremely crumbly and feel apart easily . 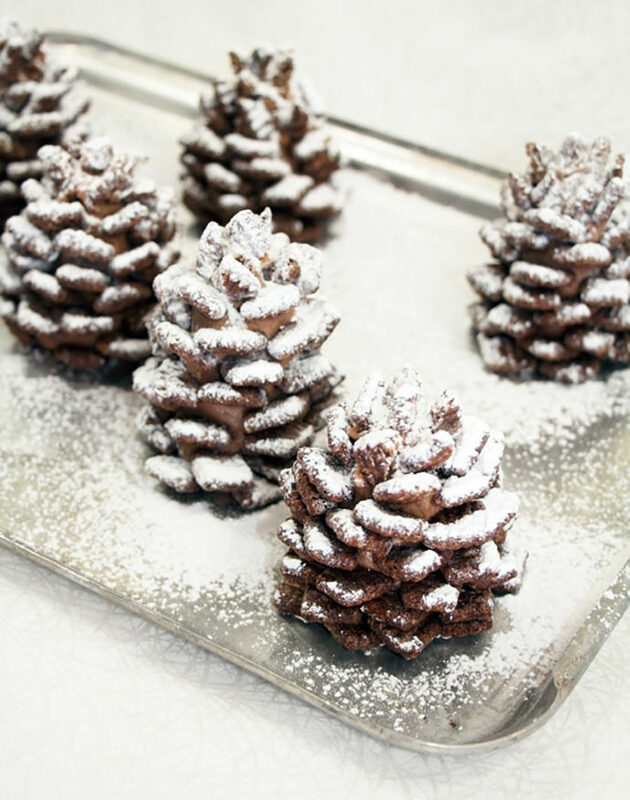 Without the powdered sugar, you couldn’t tell what these “pine cones” were if you didn’t already know. 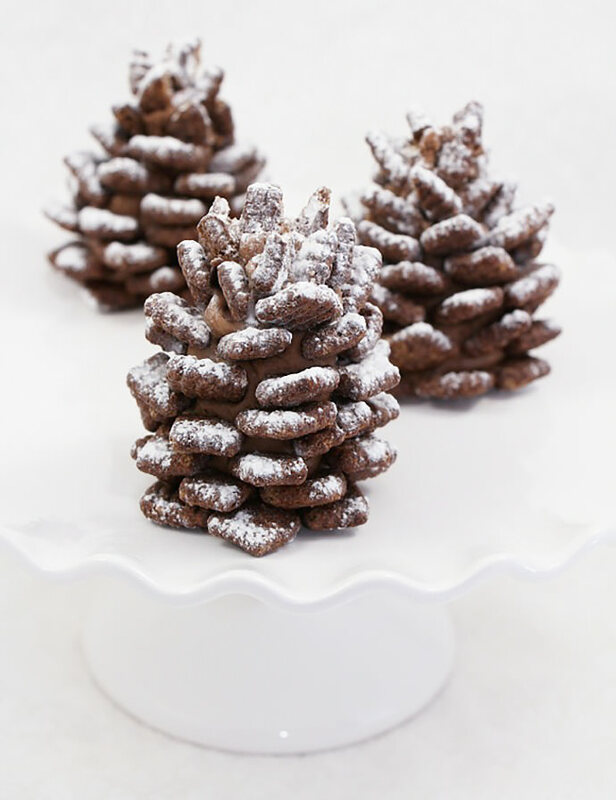 We used Chocolate Chex to make the cones around the pinecones and you could not break them in half, if you tried they would crumble so we ended up putting crumbles on top. The measurements were also off, we decided to double the recipe and we ended up with not enough. If you do make this put more dough around the pretzel then you think or they won’t stick to it. We made it for thanksgiving and it was a lot harder than you would think it would be. I don’t suggest this recipe for people who want things exact or care what the outcome looks like. Thanks for sharing your input, Janat! We’re sorry to hear that your pinecones didn’t work out exactly as you’d hoped but we’re betting they were still super tasty! We’ll take a look at the ingredients’ measurements as well – thanks!! I must have missed the dimensions because I made the recipe exactly as posted and it yeilded 13 pinecones the height of a thin pretzel stick. Worked out great for my needs. Had a little of the mixture leftover so I rolled it in crushed cereal and powdered sugar and said it was deer poop. Gross name but kids loved it.